Trainer David Payne believes Tarka can get back on track for the Victoria Derby Gr.1 with the addition of blinkers in the Spring Champion Stakes Gr.1 at Randwick this Saturday. Stablemate Ace High won last year’s Spring Champion Stakes – Victoria Derby double. Payne also nominated All Too Hard mare All Too Soon for the Angst Stakes Gr.3 and the Vinery sire has Warranty and Za Zi Ba equal $6 favourites for the Winning Edge Sprint which closes the card at Randwick. On the other side of the country, unbeaten Testa Rossa mare Enticing Star (pictured) begins a Group 1 campaign of her own at Belmont this Saturday. The Bob Peters homebred only has four rivals for her first taste of black-type in the Birthday Stakes LR at Belmont. She has won 7 times in 7 starts from a Pinjarra maiden in June 2017 to a Belmont Benchmark 72 in June 2018. 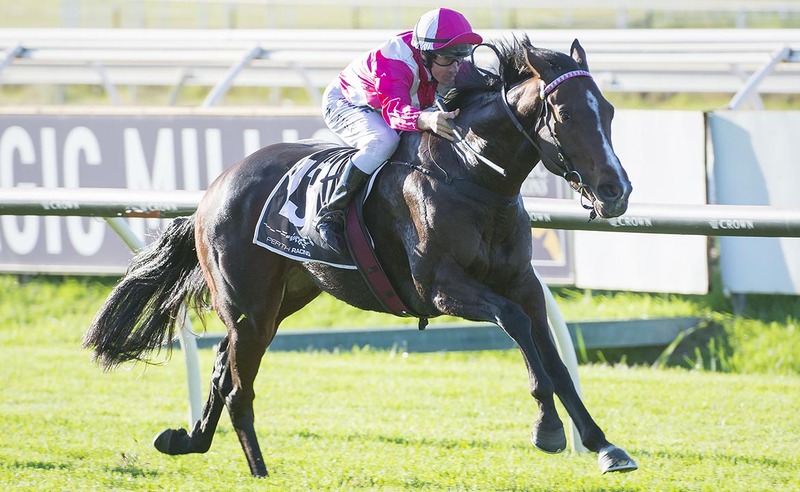 Enticing Star (5m Testa Tossa – Favourite Star by More Than Ready) is closely related his Group 2 winners Perfect Jewel (WA Guineas) and Star Exhibit (Perth Cup). Peters bought into the family at the 2001 Inglis Easter yearling sale when he purchased their second dam Lady Ashford (Royal Academy) for $130,000 from Vinery. Her goal this prep is the $1 million Winterbottom Stakes Gr.1 at Ascot on December 1. Perth’s premier sprint has been a focus for Vinery sires in recent years. Testa Rossa mare Ortensia doubled up in 2009 & 2011 and Mossman champion Buffering saluted in 2013. Peters also has More Than Ready stayer State Prosecutor set for another stakes victory in the Kalgoorlie Cup LR on Saturday. He has been installed a $2.30 favourite for the Goldfields grand-final that’s worth $130,000. More Than Ready 2yo Ready To Party is a $4.80 second-favourite for his debut in Race 2 at Doomben on Saturday. Trainer Matthew Dunn bought the colt for $140,000 from Vinery (as agent) at this year’s Gold Coast Magic Millions. Ready To Party won a Doomben trial a fortnight ago and his dam Borobodur (Strategic) is a half-sister to Flemington Group 3 juvenile winner Dama De Noche. In North America, More Than Ready’s champion sprinter Roy H will be gunning for a second Santa Anita Sprint Championship Gr.1 on Saturday. He has opened a 6-5 morning line favourite and, like last year, trainer Peter Miller will use it as a final lead-up to the Breeders Cup Sprint Gr.1 next month. Mossman miler Crack Me Up continues his path towards a Group 1 at Flemington this Saturday. Trainer Liam Birchley believes he can break the ice in Melbourne despite being asked to shoulder 60kg in the Paris Lane Stakes LR over 1200m at headquarters. Mossman veteran Dothraki won the Bobbie Lewis and he returns to Flemington for the Gilgai Stakes Gr.2 on Saturday. Jockey Hugh Bowman will have to keep focused down the straight-six after partnering Winx in the Turnbull Stakes Gr.1.